After breakfast in camp, we amble down to see the beautiful Kakabeka Falls. Here the Kaministiquia River flows down from the Laurentian Divide and suddenly plunges over the lip of a slate geological fault. 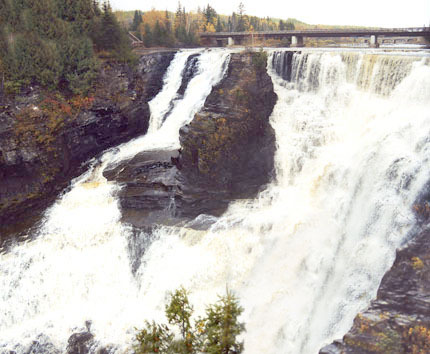 Sometimes called the Niagara of the North, Kakabeka drops over 120 feet in a spectacular, roaring falls, crashing at the base and producing perpetual wreaths of mist and spray. 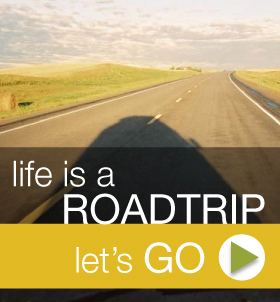 It is only a short drive to where the Kaministiquia enters Lake Superior. In 1803 the North West Company built Fort William at the river’s mouth, and for many years the site served as the Company’s key shipment center on Lake Superior. Now reconstructed and opened as a living history program, the Fort depicts the days of the booming fur trade, circa 1803-1821. Heavily-laden voyageur canoes arrived here from Montreal, bearing manufactured trading goods for the Fort. 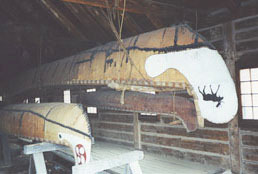 Meanwhile, the American and Canadian interiors produced tons of furs—beaver, fox, badger, mink, even raccoon—carried down in small river canoes. These sixteen-foot Indian craft were well-suited to the narrow streams, dangerous rapids, and long portages common in the remote country. After sorting and packing here at the fort, the furs continued east in huge Montreal canoes. At 36 feet in length, they carried up to 8000 lbs. of cargo and were driven across the great inland sea of Lac Superiore by twelve strong men. On these return trips the canoes were often so heavily loaded with furs that the gunwales were only a hands-breadth above the waterline. 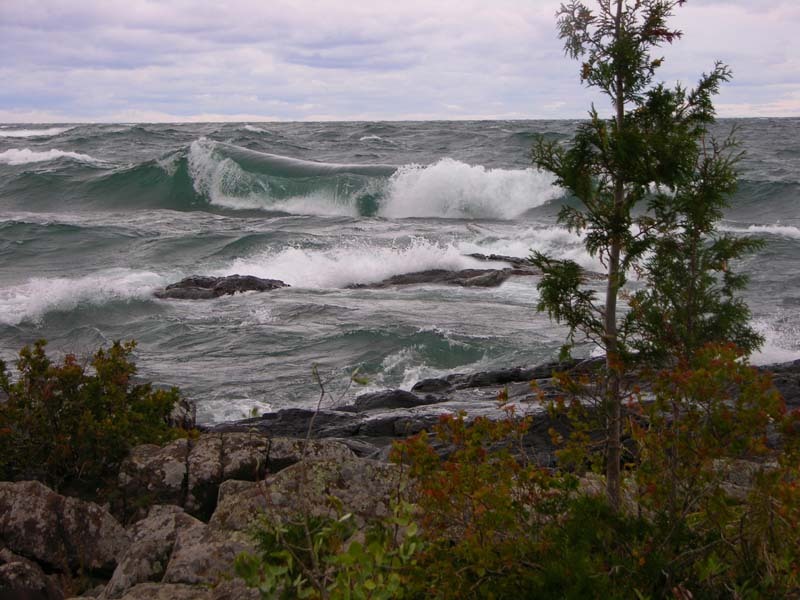 These hardy men paddled many miles each day across unpredictable and sometimes stormy Superior, camping along the way. Sticking close to shore, it is nearly 400 miles from here to Sault Ste. Marie, far on the other side of the lake. I imagine these voyageurs of old departing Fort William on mornings similar to this one, paddling into the cold and stinging rain, struggling with their heavy loads and unwieldy canoes into the surging and violent waves of Superiore. On such portages, these 90-lb. 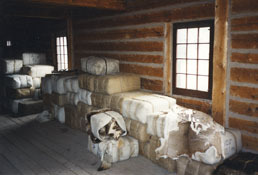 bales of furs were carried two or three at a time on the bent backs of the voyageurs. So it’s no surprise that the most common cause of death among these unfortunate camarades was not snake-bite, pnuemonia, or broken bones, but strangulated hernias. As I absorb the authentic frontier atmosphere and inhale the musty aroma of damp rodent pelts, I notice Lorie is equally entranced by another historical display, but this one of the voyageur variety. It seems she is a bit enamored of the smart and hairy-faced tour guide in the beads and the leather bathrobe. With wide-eyed interest she asks precocious and obsequious questions about the buckskinnin’ life, and he responds with warm and authoritative answers, stroking his scruffy beard like a backwoods scholar. After a sullen lunch of Voyageur’s Stew (hefty chunks of moose flesh, with a few token peas, carrots, and diced potatoes) eaten in the rustic dining hall, we motor through the gloomy industrial city of Thunder Bay, a grey drizzle constantly spraying the Vanagon’s windshield. Swinging onto the Trans-Canada Highway, we follow the rugged Superior shoreline eastward through Nipigon, Terrace Bay, and White River. 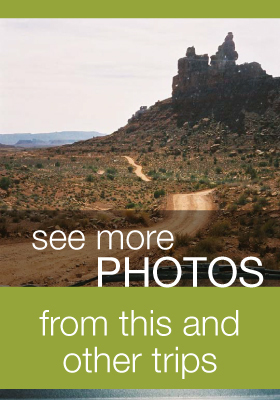 We drive on through an increasingly barren landscape known as the Canadian Shield, a vast region encompassing parts of Alberta, northern Saskatchewan and Manitoba, Ontario, Quebec, Labrador, eastern Minnesota, northern Wisconsin, and northern Michigan! There were once great mountains here, but they were long ago eroded by water and eons of freeze-thaw cycles. Most of the Canadian Shield is now coniferous forests, but here we see the rocky, eroded stumps of the former mountain range. Though unseasonably warm, most of the provincial parks are closed this late in the season, so we drive late into the evening, finally stopping at an RV park in Wawa, Ontario. When we pay our bill, the proprietor asks if we saw any moose along the road from Thunder Bay. “Only the ones on the road signs,” I reply. In camp, we make some dinner and settle in for the night, retracting the pop-up roof to conserve heat in the crisp autumn air.